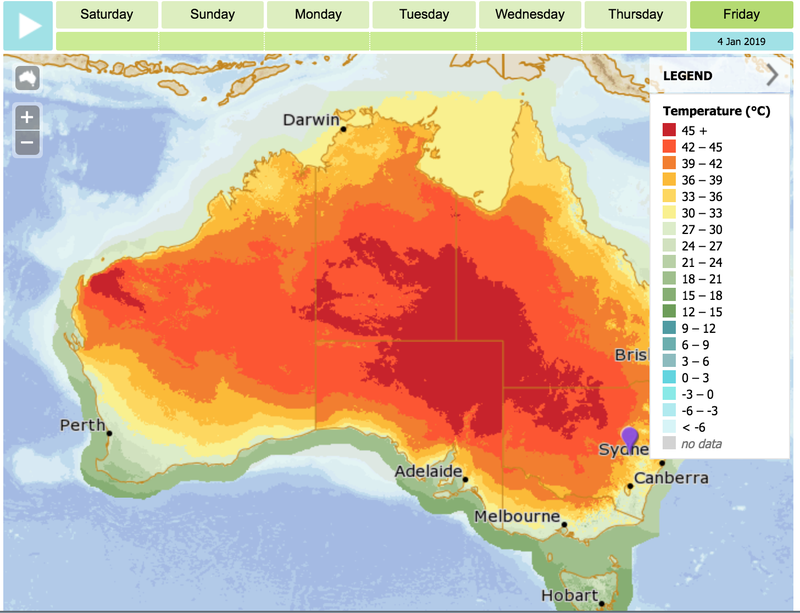 The Bureau of Meteorology in the lead up to christmas in 2018 showed a heatwave building through the week. The forecast was for severe and extreme heatwave impacts particularly Thursday 27 December to Saturday 29 December. A blocking high in the Tasman and strong heat from the Pilbara in Western Australia and right through Central Australia, will periodically extend tendrils of sweltering heat to encompass the major population centres of Adelaide, Melbourne and Sydney. While these cities may get occasional relief from weak cold fronts and coastal sea breezes, inland towns will swelter in the scorthing heat with temperatures in the mid to high 30s and low 40s. 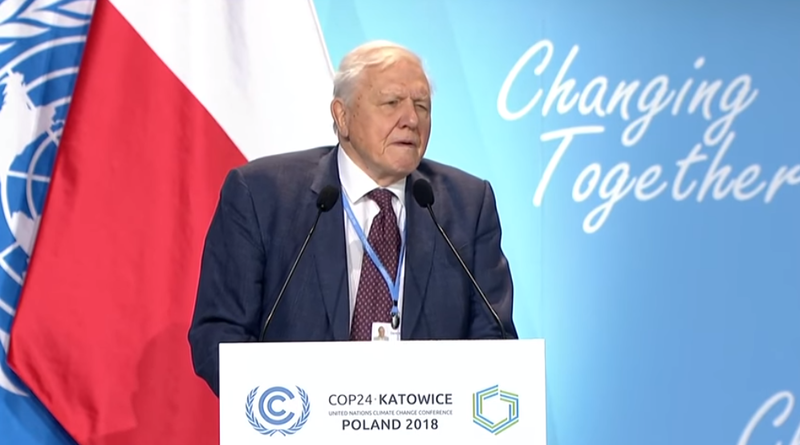 Well The United Nations Climate Change Conference in Katowice - COP24 - did give us a deal, it did provide the Paris Rulebook (mostly), but it failed to substantially increase ambition. For the moment it kept the momentum of the Paris Agreement Moment alive, despite the climate denial of the Trump administration, and despite Brazil's new President elect Jair Bolsanaro. The negotiations were highly technical focusing on the detail of the Paris Agreement, the so called rule book for how to apply, implement and operationalize the agreement signed in Paris three years ago. The UNFCCC works by consensus by the 197 parties, so achieving agreement is always difficult, and when it gets down to the fine details even more so. The science has become very clear that we need to rapidly act to reduce emissions, so the glacial pace of negotiations is very frustrating. Delays and incremental advancement is as good as failure. Federal ALP conference has adopted a climate change motion that highlights the IPCC Special Report on 1.5C and that we are in a climate emergency. 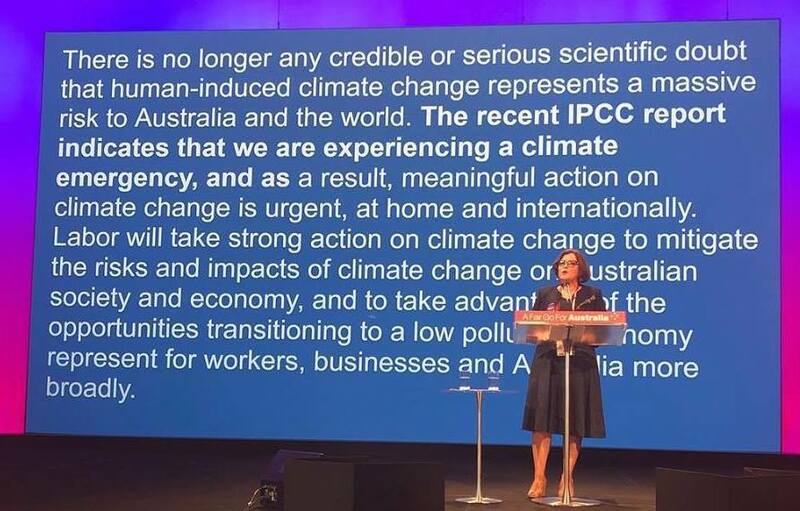 Labor MP for Batman (being renamed Cooper), Ged Kearney, moved the motion on climate change at the ALP national conference. There is no longer any credible or serious scientific doubt that human-induced climate change represents a massive risk to Australia and the world. The recent IPCC report indicates that we are experiencing a climate emergency and, as a result, meaningful action on climate change is urgent, at home and internationally. Labor will take strong action on climate change to mitigate the risks and impacts of climate change on Australian society and economy, and to take advantage of the opportunities transitioning to a low pollution economy represent for workers, businesses and Australia more broadly. The motion was carried, without a vote from the floor. 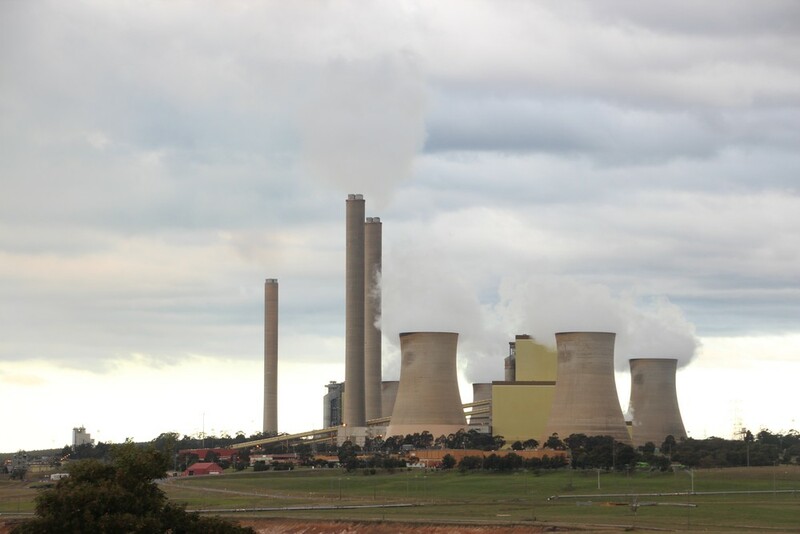 The Powering Past Coal Alliance announced on Friday that Sydney and Melbourne had joined the Alliance at an event: Accelerating the global coal transition. This follows the Australian Capital Territory joining in September 2018. 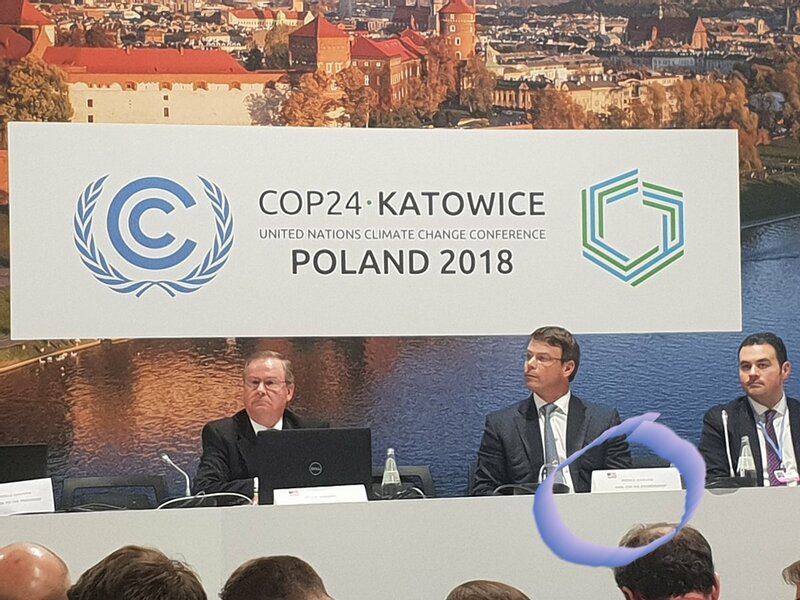 Other states and businesses that joined at COP24 included Israel, Scotland, Senegal, and Scottish Power. The Alliance, formed in Bonn in 2017 at COP23, now includes 80 members including national governments, state or regional governments, cities, and businesses. Canada's Environment Minister Catherine McKenna Made the announcement. 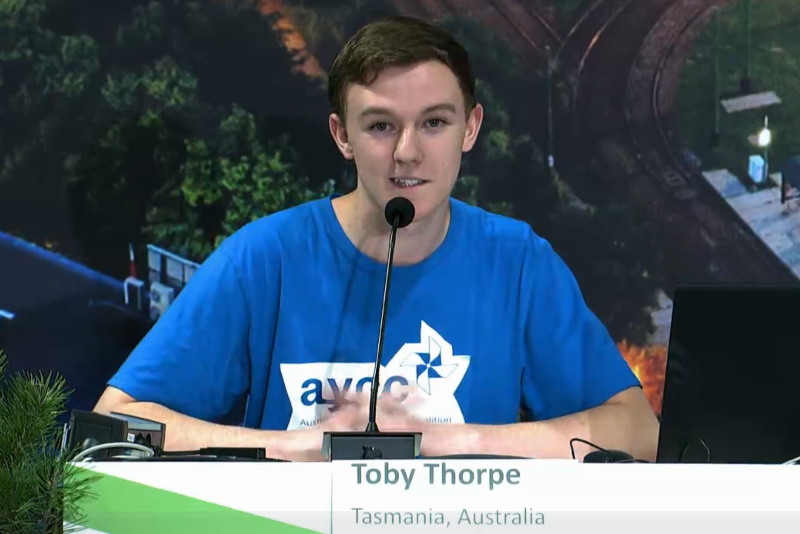 17 year old Toby Thorpe, from Hobart, a member of the Australian Youth Climate Coalition (AYCC), raised the need to stop the Adani coal mine in a press conference at the United Nations Climate Conference COP14 on Thursday, as the climate conference was drawing to a conclusion. He was one of four youth activists at this press conference speaking on the need to increase climate ambition and targets, to include climate justice in the writing and final negotiations of the Paris rulebook. He sent a message to Australian Prime Minister Scott Morrison and Opposition Leader Bill Shorten to stop Adani, to stop the politicisation of acting on climate change. 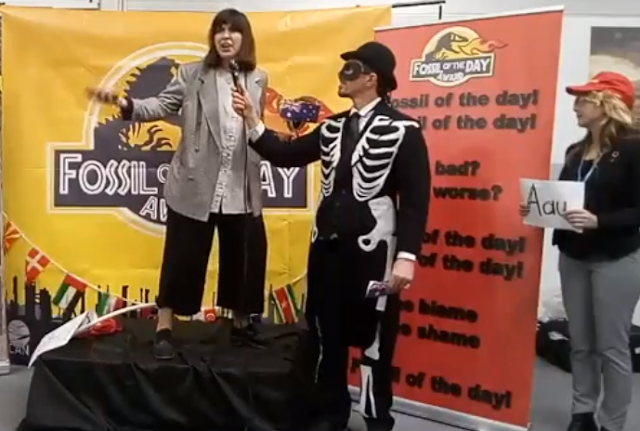 "So right now I am calling on my Prime Minister Scott Morrison, the Opposition Leader Bill Shorten, to stop politicising this issue and accept this threat to our future, and our descendants future." "You are not mature enough to tell it like it is, even that burden you leave to us children. But I don't care about being unpopular. I care about climate justice and the living planet. Our civilisation is being sacrificed for the opportunity of a very small number of people to continue making enormous amounts of money." 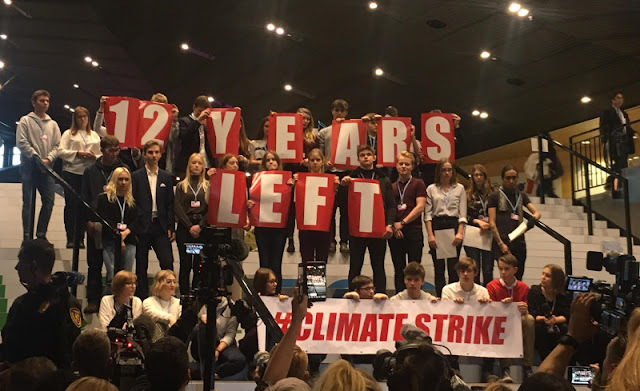 Fifteen year old Greta Thunberg, who started 'climate fridays' and 'climate strike' outside of the Swedish parliament some 17 weeks ago, addressed the high level segment of the United Nations climate conference, COP24 on December 12. 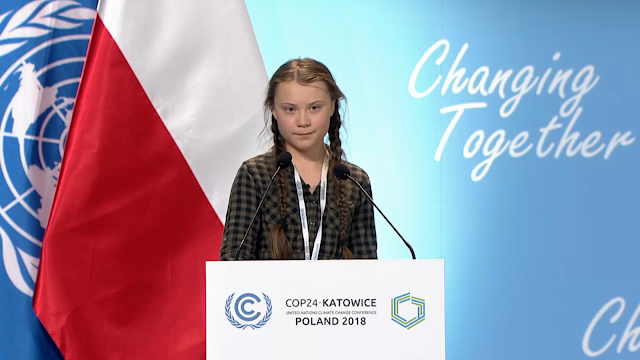 Her speech was so clear, concise and direct, Is it any wonder that she is inspiring student climate strikes around the world. She inspired a small group of Castlemaine students to step up in Australia ion November with School strike for climate action which saw 15,000 people March in Brisbane, Melbourne, Sydney and Cairns Demanding Labor Stop Adani’s coal mine on 30 November. She demolished the argument that just because you are small, or a country has a very small proportion of global pollution, that action should not be taken. She addressed the issues of generational theft and equity. While not calling it an emergency, she articulated that we can't solve the crisis until we name it as such. Greta called for us to focus on what needs to be done, not on what is politically possible. She called to keep fossil fuels in the ground and also to do so with a focus on equity. Just Transition should be a very important part of what is done to solve the climate crisis. She is so young to articulate cynicism at the climate talks, but they have been going for some 24 years with so little progress. She warned the plenary and the parties assembled that change is coming, whether they like it or not. "We have not come here to beg world leaders to care. You have ignored us in the past, and you will ignore us again. We have run out of excuses and we are running out of time. We have come here to let you know that change is coming, whether you like it or not." 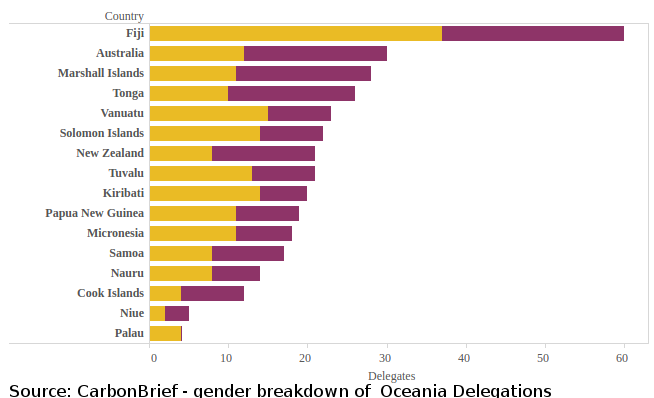 Pacific Island Nations, Least Developed Countries, and Climate Vulnerable Forum have all raised concerns over the level of ambition by the developed countries, including Australia. While some progress appears to have been made on development of the Paris rulebook, talks appear to have reached a substantial deadlock. While some nations have lifted ambition at COP24, many are still yet to commit to increasing targets or climate action. It should be noted the Marshall Islands has lead by example and is the first nation to submit a new more ambitious NDC to the UNFCCC on 22 November around the margin of the virtual climate summit hosted in November. 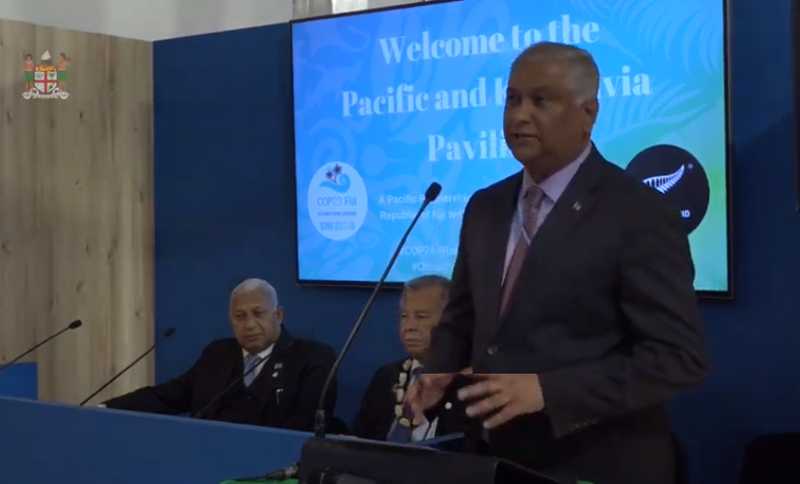 Of particular relevance to Australia is the Pacific Islands' declaration calling on all OECD countries to quickly phase out their use of coal by 2030 "There must be no expansion of existing coal mines or the creation of new mines." says the declaration. 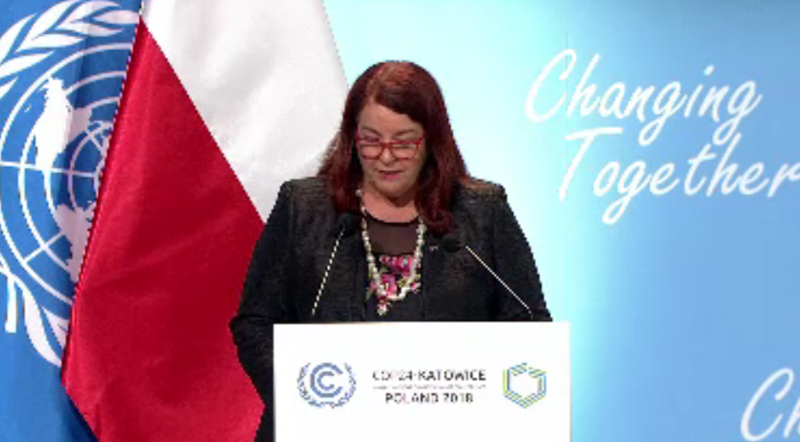 Australia's ministerial statement by Environment Minister Melissa Price failed to address any ambition and ignored the calls to reign in coal expansion and stop the Adani Carmichael coal mine in the Galilee Basin of Queensland. 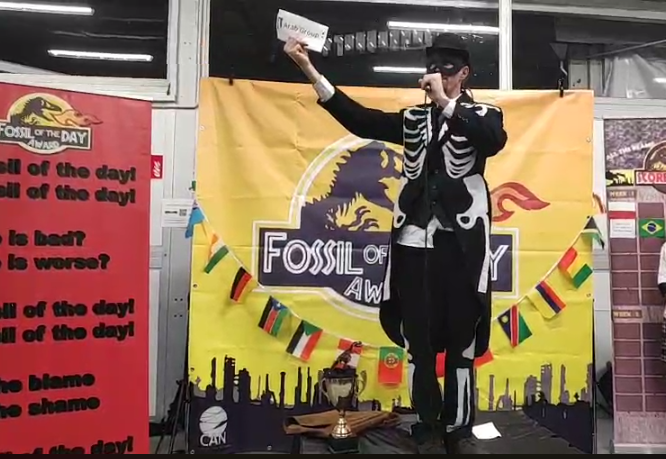 No surprises here that host Country Poland has received the Colossal Fossil Award of COP24 for it's behaviour incongruent with a climate change conference, including continuing emphasis on coal development, and coal company sponsorship of the COP. What was even more concerning was the security legislation passed early this year, and it's by Polish authorities to deny entry and/or deport at least 12 members of civil society groups due to attend the UN climate talks in Poland. 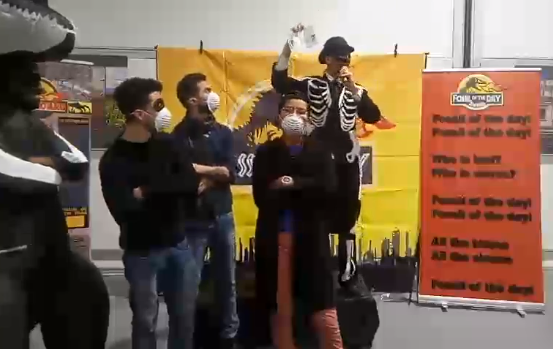 Note the Amnesty International report on Poland: Arrests and Refusal of entry to environmentalists during the COP24 climate talks, which documented that at least 13 staff members and activists of environmental organizations were refused entry to Poland during the UN Conference on Climate Change, COP24, held in Katowice. In addition, three staff members of environmental organizations were questioned in their hotels about their IDs by the border police in Katowice. Two of them were arrested and detained for 12 hours. 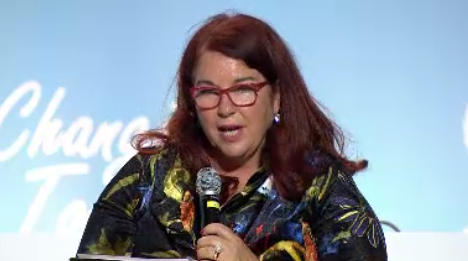 As I watched and listened to Australian Environment Minister Melissa Price statement on behalf of Australia to the High Level Segment of the United Nations Climate Change Conference, Conference of the Parties (COP24), I decided I wanted to annotate, correct falsities, mistruths or distortions and place her words into political historical context. I transcribed her speech, then circulated it inviting other people to add details. Several people did so, and I fact checked these contributions, but most of the annotation were my own. Australia displayed a total lack of ambition, in stark contrast to quite a few other nations who made announcements of increased climate ambition actions. No mention of lifting Australia's targets, currently rated as insufficient. No mention that Climate Finance has been incorporated as part of the Foreign Aid budget which has suffered substantial real reductions over the last four years. No mention was made of Australia continuing to expand coal export trade and the protests and opposition to the Adani Carmichael mine. No mention that Prime Minister Scott Morrison withdrew the minimal funding support to the Green Climate Fund in October 2018. Some of the actions being lauded, such as the Clean Energy Finance Corporation, the Government actually tried to abolish but had been stymied by a hostile Senate. 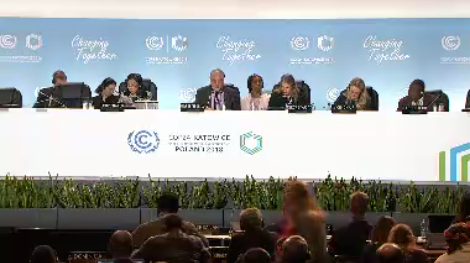 The transcription was based on the UNFCCC on-demand video of the second part of the High Level Segment conducted on Wednesday 12 December 2018. 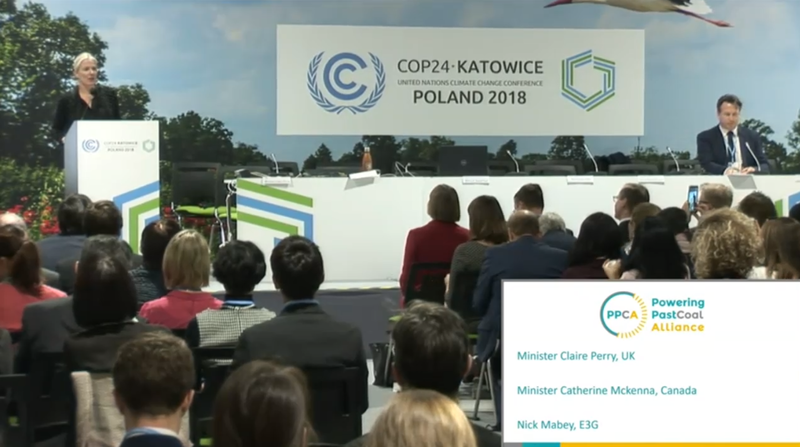 An un-annotated version of Minister Price's speech to COP24 follows at the end. The latest assessment of country emissions and climate policies aggregated globally shows that there is still a substantial gap to meet, according to Climate Analytics, who have been analysing and tracking country climate policies and global emissions for the last decade on their Climate Action Tracker website. If all governments achieve their largely insufficient climate targets, the world will see 3.0˚C of warming by 2100, twice the 1.5˚C limit they agreed in Paris three years ago their latest analysis shows. This analysis does not include the potential for climate feedbacks and tipping points in the climate system that might boost the level of global warming to 'Hothouse Earth' conditions (Study). 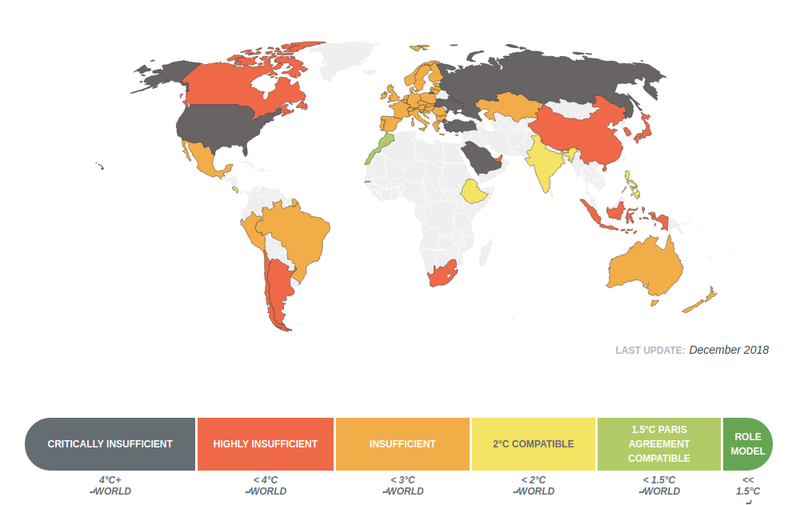 Current Government pledges in the Nationally Determined Contributions (NDCs) would lead to warming of 3.3˚C. If governments were to implement the planned or additional policies they have in the pipeline, warming would also be limited to 3.0°C by 2100. Well today's Fossil Award came from the leftfield. But on some days the least expected step up to be the worst, who does the most to be the least, and who tries their hardest to make sure we don't get fair justice and a binding climate deal. Egypt, the land of the pyramids, this day is yours for Fossil of the Day, for being dead set against ambition in Talanoa. Melissa Price is the Liberal MP for Durack and a former corporate lawyer for mining companies. So far Australia has not been terribly popular at this conference with civil society and a great number of other parties. Australia was completely silent over to 'note' or 'welcome' the IPCC Special Report on 1.5C in the SBSTA. Given Australia chairs the Umbrella group, the silence spoke heaps about Australia's role. Then the Australian ambassador for the Environment and head of the negotiating team for Australia, Patrick Suckling, was featured as a speaker on a US Government side-event promoting clean coal and CCS as climate solutions. Given these two incidents perhaps we need to keep track of our Environment Minister at COP24. Some unusual suspects today. 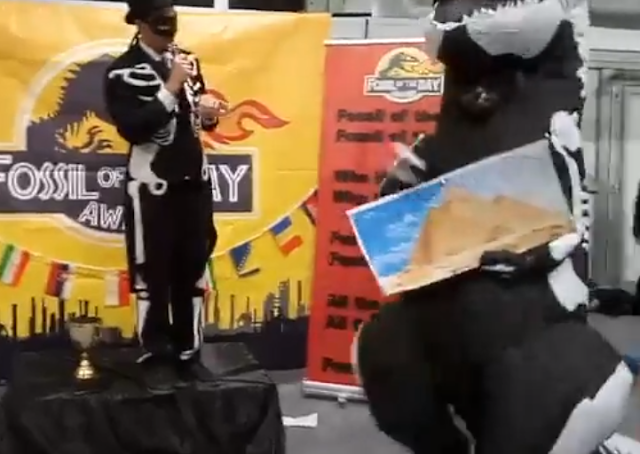 While everyone was looking at SBSTA discussion on to 'note' or 'welcome' the IPCC special report on 1.5C, these bad boys snuck in and whisked away the Fossil of the Day awards. The first Award went to the developed countries of the Executive Committee (Excomm) of the Warsaw International Mechanism (WIM) on Loss and Damage. 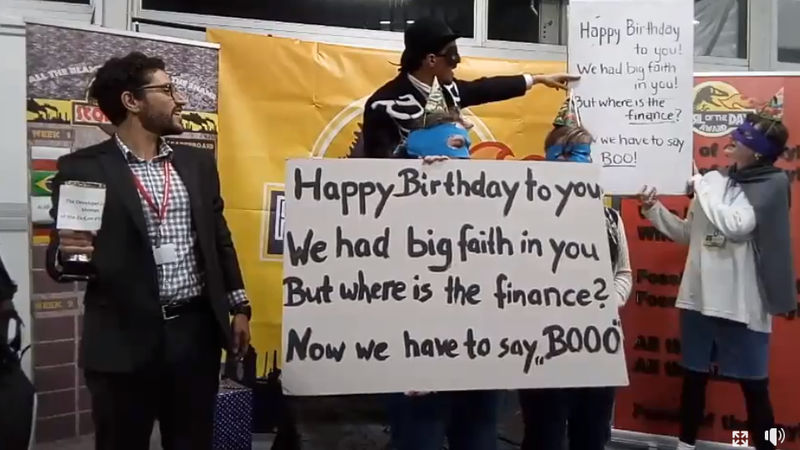 Five years old and still not a penny of climate finance. How miserly the parents are. But the Climate Action Network is gracious and sang them a Happy birthday message. 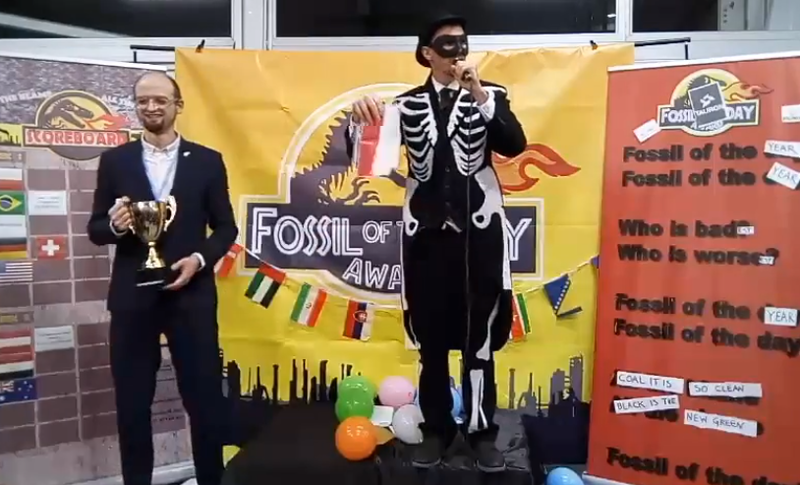 The second Fossil Award to Austria for subsidising coal. Yes, you heard me right, Austria, not Australia! Austria has the presidency of the European Council and wants to subsidize existing and new coal plants for the next 17 years through backdoor mechanisms. Really Austria, you know you can't compete with Australia when it comes to coal (Cough Cough). The Australian Ambassador for the Environment, Patrick Suckling, appeared on a panel for a US government side-event pushing clean coal technologies as climate solutions. The session on Monday 10 December was called: "U.S. Innovative Technologies Spur Economic Dynamism - Promoting innovative approaches". One must ask was Ambassador Suckling's presence sanctioned at Ministerial level? His attendance on the panel is hardly good diplomacy for Australia, even given the Liberal Government support for coal and weak climate targets and climate policy. They chanted "Keep it in the ground" and "Shame on you", before leaving the session. After they left, there were very few people to listen to the myths being spouted of clean coal. 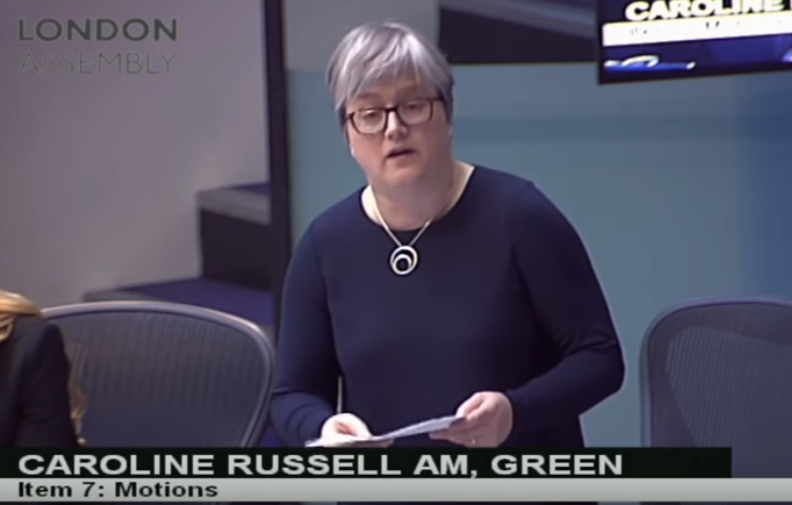 The London Assembly has passed a motion by a vote of 12 votes for, 0 against, for declaring a climate emergency. The motion by UK Greens Councillor Caroline Russell urges that the Mayor should "declare a Climate Emergency, supported by specific emergency plans with the actions needed to make London carbon neutral by 2030". This follows on from the City of Bristol declaring a climate emergency on 13 November 2018, the first UK council to declare a climate emergency. The Bristol motion was passed unanimously. Consequently, the city council set an ambitious goal of making Bristol carbon neutral by 2030. Caroline Russel also referred to David Attenborough speech to the United Nations climate change conference COP24 meeting in Katowice, Poland, in which he warned, "If we don’t take action the collapse of our civilisations and the extinction of much of the natural world is on the horizon." The IPCC 1.5C climate science report published in October was also referred to in motivating rapid social transformation needed for meeting the Paris Agreement climate targets and avoiding dangerous climate change..
During negotiations on Saturday at the UN climate change conference fossil fuel major countries blocked welcoming the IPCC Special report on 1.5C target for informing the negotiations. Blocking countries were Saudi Arabia, USA, Kuwait, and Russia. The Intergovernmental Panel on Climate Change (IPCC) special report on 1.5C was initiated by the Conference of the Parties as part of the Paris Agreement in 2015. The report was based on over 6000 peer reviewed papers. The Summary for Policy makers document of the report was approved by a meeting of government representatives on the IPCC. Eleanor Roosevelt would be turning in her grave at the current US Administration antics at COP24. Yes, the USA picks up today's Fossil award for their arguments on excluding mention of human rights in the Paris rulebook, when they are specifically mentioned in the preamble of the Paris Agreement. Concerns were raised earlier about whether human rights were being included in Paris Agreement rulebook at COP24. And the USA has chosen to follow through by stepping up and challenging the inclusion of a reference to the preamble, saying it was attempting to operationalize something that by definition wasn’t operational. 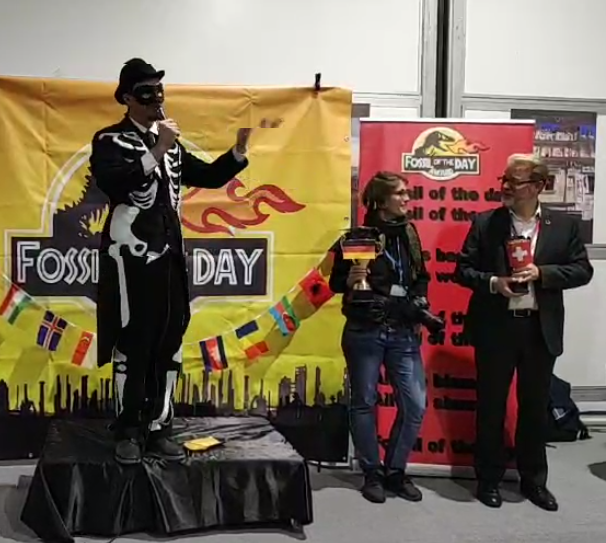 The first placed Fossil Award to Germany for failing to make substantial progress on it's 2020 targets, failure to progress phaseout of coal as promised. The second Fossil Award to Switzerland over being on of the loudest and most consistent blockers on climate finance during these negotiations and the provision of new and additional funding. Are human rights being included in Paris Agreement rulebook at COP24? 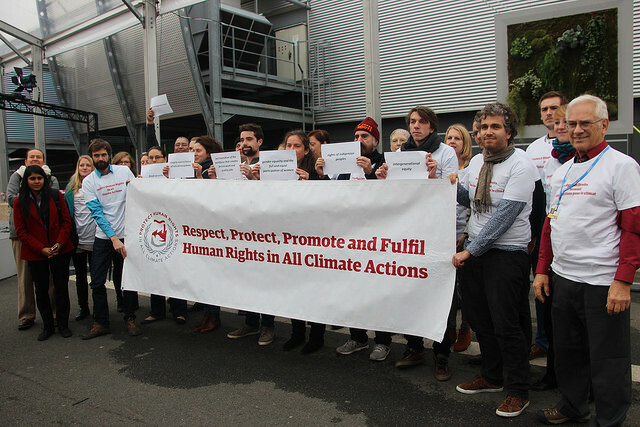 Civil society organisations fought hard at the United Nations Climate Change conference COP21 in Paris in 2015 for human rights obligations to be included as part of the Paris Agreement text. This was an important recognition of social justice in addressing climate change. However, it appears there has been little mention or discussion of inclusion of human rights obligations in negotiations this week in Katowice, Poland at the current United Nations climate change conference, COP24. Time is fast closing and final draft texts are nearing completion before the ministerial meetings of the Conference of Parties takes place early next week. It is highly important that human rights obligations are included in relevant portions of the Paris Agreement rulebook presently being negotiated. Well the Arab Group is off to a great start this Conference of the Parties (COP) in Poland with a second fossil award. This time it was for Kuwait wanting to delete specific references to findings in the IPCC 1.5°C Special Report in negotiations in the Warsaw International Mechanism (WIM) for Loss and Damage. No surprise here to find our old blocking friend Saudi Arabia reappearing, and on behalf of the Arab group, no less, for trying to kill ambition and prevent more transparency. And a late runner has entered the competition. Oh Brazil, how could you? It seems the new President has plans for the Amazon rainforest that involve deforrestation and will also drive massive impacts on indigenous people of the Amazon. Seriously not good for climate or people. 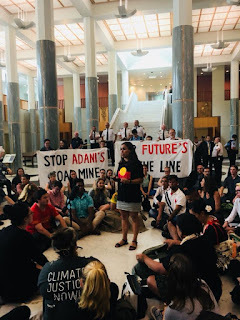 Students involved in the National School Strike for Climate Actionjoined First Nations leaders from Seedmob, youth leaders from AYCC and climate experts to hold a peaceful occupation of approximately 100 people in the foyer of Federal Parliament House in Canberra on Wednesday 5 December. This follows a climate strike involving over 15,000 students and supporters on Friday 30 November in all capital cites and some 20 regional cities and towns. 2. Take a photo with us and a StopAdani sign to demonstrate your opposition to the mine and support for our future. 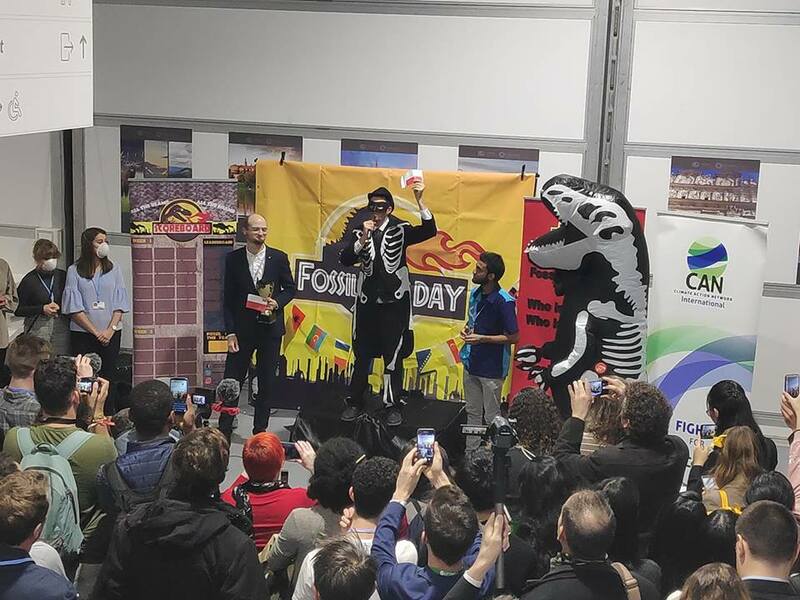 The decision has been made for the first Fossil of the Day of COP24, meeting in Katowice in Poland. Was it for Australia and Environment Minister Melissa Price with her denial of the IPCC 1.5C climate report message on coal and social transformation needed? Was it for Saudi Arabia for blocking negotiations? Was it for the US Trump Administration and the continued dismantling of Federal emissions reduction regulations? No....it is for the host country of this year's UN climate change conference being held in the middle of Silesia - coal country. A conference heavily sponsored by state owned coal companies. 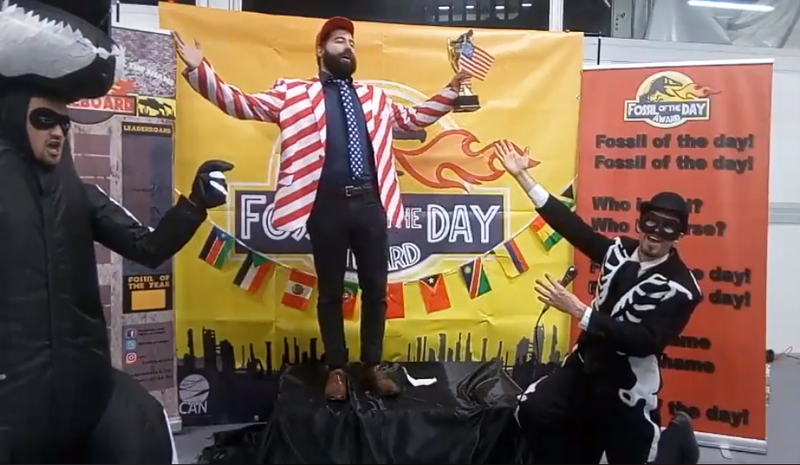 "Today’s Fossil of the day goes to Poland for trying to protect their one true love – coal – and not its people and environment, as well as for downplaying the urgency of climate action that we need to stay alive - a negotiated decision to strengthen NDCs in line with the IPCC Special Report on Global Warming to 1.5C." says the Climate Action network. 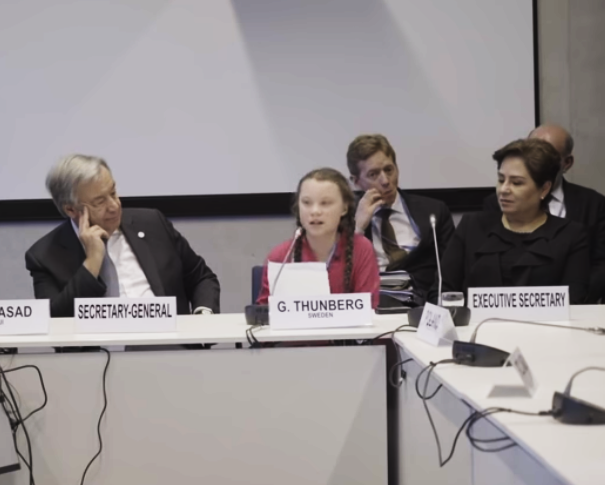 Greta Thunberg, the 15 year old Swedish student who started a climate strike outside the Swedish parliament, and initiated a global movement of students and kids for climate action, is at the United Nations climate change conference in Katowice, Poland, COP24, and addressed the UN Secretary General António Guterres. She did not mince her words, but spoke directly to what is needed, what will happen. ‘We the peoples of the United Nations’. These are the opening words of the UN Charter. A charter that puts people at the centre. A pledge to give every person in the world a voice on its future. A promise to help protect the weakest and the strongest from war, famine and other man-made disasters. If we don’t take action the collapse of our civilisations and the extinction of much of the natural world is on the horizon. 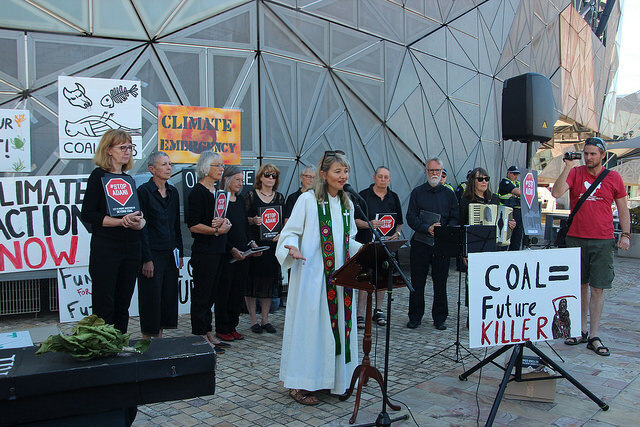 Funeral for Our Future - a Service conducted by Stop Adani Melbourne and friends, officiated by Uniting Church Minister Rev Alex Sangster. Included a Processional march by Riff Raff Marching Band, Songs lead by the Climate Choir, Eulogy for the Reef by Alan Cuthbertson from Stop Adani Melbourne, Eulogy for Nature by Joseph Birckhead and Audrey Cooke, Euology for Children's Future by teenager Marco Bellemo, Call to Action by Rev Alex Sangster and Marco Bellemo.